Caswell was created 8 April 1777 from Orange County. Originally, the county seat was at Leasburg. When Person County was created from the eastern half of Caswell County in 1792, the county seat was moved to what today is Yanceyville. Caswell County was created in 1777 from the northern portion of Orange County. In 1792, the eastern half of Caswell County became Person County. No further boundary changes have been made since 1792. For animated maps illustrating North Carolina county boundary changes, “Rotating Formation North Carolina County Boundary Maps” (1664-1965) may be viewed for free at the MapofUS.org website. Caswell County comprises nine townships: Anderson, Dan River, Hightowers, Leasburg, Locust Hill, Milton, Pelham, Stoney Creek, and Yanceyville. Major communties are: Leasburg, Milton, and Yanceyville (with Milton and Yanceyville being the only incorporated towns in the county). Widow Going – horses 350, 20 cattle 200, 8 negroes of which 4 is under 10 – 400, 112 dollars 15 silver – 45.11. Allen Going – 1 horse 100, cattle 20, Silver 122.9.0, 122.9. Daniel Going – horses 470, 546.1/4 dollars 218.10, 3 horses, 3 cattle 30, 7 fellow 700. John Going 2 horses 70, 7 dollars 2.16. Suffiah Gowing – 4 negroes above 10 and under 40, 1 between 40 to 50 years, and 1 under 5; 6 head of horses and heads of cattle; cash on hand 336.7.0. Jesse Gowing – one mare 139.16; cash 19.0.16.
http://ourberryfamily.com/berry/pictures/sitha_&_david_logan_marriage_cert_.jpg ; “North Carolina, County Marriages, 1762-1979 ,” database with images, FamilySearch(https://familysearch.org/ark:/61903/1:1:F8P8-2WR : 3 November 2017), David Logan and Lithe Going, 18 Nov 1783; citing , Caswell, North Carolina, United States, p. item 1, North Carolina State Archives Division of Archives and History; FHL microfilm 478,486. 1783 Nov 18 – David Loughgin m. Lithe Going w Jesse Going as bondsman. “North Carolina, County Marriages, 1762-1979 ,” database with images, FamilySearch (https://familysearch.org/ark:/61903/1:1:F8PW-Q6R : 3 November 2017), David Loughgin and Lithe Going, 18 Nov 1783; citing , Caswell, North Carolina, United States, p. Item 1, North Carolina State Archives Division of Archives and History; FHL microfilm 478,484. “North Carolina, County Marriages, 1762-1979 ,” database with images, FamilySearch (https://familysearch.org/ark:/61903/1:1:F8P8-1QH : 3 November 2017), Jesse Going and Seley Or Seeley Bairding, 09 Jun 1784; citing , Caswell, North Carolina, United States, p. vol D, North Carolina State Archives Division of Archives and History; FHL microfilm 478,485. “North Carolina, County Marriages, 1762-1979 ,” database with images, FamilySearch (https://familysearch.org/ark:/61903/1:1:F8P8-1QD : 3 November 2017), John Going and Seeley Bairding, 09 Jun 1784; citing , Caswell, North Carolina, United States, p. vol D, North Carolina State Archives Division of Archives and History; FHL microfilm 478,485. 1787 “Michile Gowine & wife & sons, Michele & David; daughter, Elizabeth & William Wilson, blacks” were enumerated about 1787 in Caswell Co, NC (Note: David Gowine and Michele Gowine – sons, and Elizabeth daughter – would be born between 1767- 1771 if they were still minors, but required to be listed on their parent’s tithe – between ages of 16-20). 0 males over 16, 0 males under 16, 0 females – white. 0 slaves. 1790 Dec 3 – Patrick Mason m. Patsey Going with Zachary and Hill as bondsmen. “North Carolina, County Marriages, 1762-1979 ,” database with images, FamilySearch (https://familysearch.org/ark:/61903/1:1:F8PW-KZR : 3 November 2017), Partrick Mason and Patsey Going, 03 Dec 1790; citing , Caswell, North Carolina, United States, p. Item 1, North Carolina State Archives Division of Archives and History; FHL microfilm 478,484. “North Carolina, County Marriages, 1762-1979 ,” database with images, FamilySearch (https://familysearch.org/ark:/61903/1:1:F8P8-1QW : 3 November 2017), Goodrich Going and Betsey Mathews, 06 Sep 1791; citing , Caswell, North Carolina, United States, p. vol D, North Carolina State Archives Division of Archives and History; FHL microfilm 478,485. 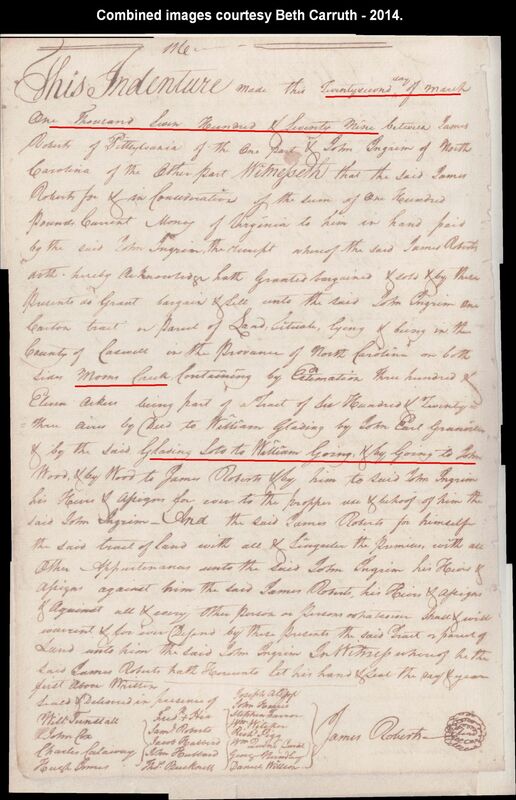 At the first session of the Person County Court of Pleas and Quarter Sessions, March 1792, the estate records of John McNeill (Niell) were proved. A merchant, John McNeill’s store was near the Caswell-Person border and very near Leasburg. From file number C.R. 078.801.1, Department of Archives and History, Raleigh, North Carolina. Note: The amount of debt was omitted from the following list. The list is very long and includes the name of EDWARD GOING. “North Carolina, County Marriages, 1762-1979 ,” database with images, FamilySearch (https://familysearch.org/ark:/61903/1:1:F8P8-1QX : 3 November 2017), Sherwood Going and Ruth Bennett, 30 Apr 1793; citing , Caswell, North Carolina, United States, p. vol D, North Carolina State Archives Division of Archives and History; FHL microfilm 478,485. “North Carolina, County Marriages, 1762-1979 ,” database with images, FamilySearch (https://familysearch.org/ark:/61903/1:1:F8P8-1QQ : 3 November 2017), John Going and Betsey Hukman, 24 Nov 1795; citing , Caswell, North Carolina, United States, p. vol D, North Carolina State Archives Division of Archives and History; FHL microfilm 478,485. Against: Sophia Going, Jesse Going, John Going and Sherwood Going .. 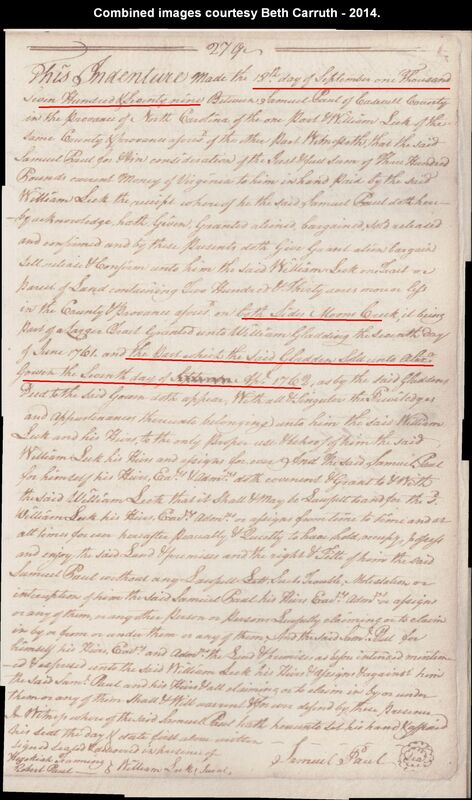 Tenants – Upon a Writ of Right… Pittsylvania Co, Va. 1798 May 21- Sophia Going Sr, John Going, Jesse Going, and Sherwood Going sued by George Clompton on testimony of James Saunders of Caswell County, North Carolina. Sophia, Sr., was apparently living on land claimed by George Clopton on 21 May 1798 when he sued Sophia, John, Jesse and Sherwood Going as tenants [Orders 1783-7, 354; 1795-8, 461, 479, 486; 1798-1801, 23, 59]. Pittsylvania Co, Va.
“North Carolina, County Marriages, 1762-1979 ,” database with images, FamilySearch (https://familysearch.org/ark:/61903/1:1:F8P8-L3T : 3 November 2017), Richard Chapman and Sally Going, 21 Jun 1800; citing , Caswell, North Carolina, United States, p. vol c, North Carolina State Archives Division of Archives and History; FHL microfilm 478,485. 1803 July 29 – William Pryor m. Hasty Going with William Prior, Jesse Going, and Nellie Pass on bond. “North Carolina, County Marriages, 1762-1979 ,” database with images, FamilySearch (https://familysearch.org/ark:/61903/1:1:F8PC-WMC : 3 November 2017), William Pryor and Hasty Going, 29 Jul 1803; citing , Caswell, North Carolina, United States, p. item 4, North Carolina State Archives Division of Archives and History; FHL microfilm 478,487. “North Carolina, County Marriages, 1762-1979 ,” database with images, FamilySearch (https://familysearch.org/ark:/61903/1:1:F8P8-1QN : 3 November 2017), Sherwood Going and Betsey Coventon, 31 Dec 1804; citing , Caswell, North Carolina, United States, p. vol D, North Carolina State Archives Division of Archives and History; FHL microfilm 478,485. 1806 July 28 – George Stephens m. Rhoda Going with George Stephens and Joseph Flippa on bond. “North Carolina, County Marriages, 1762-1979 ,” database with images, FamilySearch (https://familysearch.org/ark:/61903/1:1:XF96-G4W : 10 February 2018), George Stephens and Rhoda Going, 28 Jul 1806; citing Caswell, North Carolina, United States, p. , North Carolina State Archives Division of Archives and History; FHL microfilm 478,488. “North Carolina, County Marriages, 1762-1979 ,” database with images, FamilySearch (https://familysearch.org/ark:/61903/1:1:F8P8-16B : 3 November 2017), Vincent Gowing and Nancey Rud, 30 Dec 1806; citing , Caswell, North Carolina, United States, p. vol D, North Carolina State Archives Division of Archives and History; FHL microfilm 478,485. “North Carolina, County Marriages, 1762-1979 ,” database with images, FamilySearch (https://familysearch.org/ark:/61903/1:1:F8P8-16T : 3 November 2017), Richard Goroint and Polly Bennett, 04 Jul 1807; citing , Caswell, North Carolina, United States, p. vol D, North Carolina State Archives Division of Archives and History; FHL microfilm 478,485. “North Carolina, County Marriages, 1762-1979 ,” database with images, FamilySearch (https://familysearch.org/ark:/61903/1:1:F8P8-1QZ : 3 November 2017), Jesse Going and Polly Draper, 12 Nov 1807; citing , Caswell, North Carolina, United States, p. vol D, North Carolina State Archives Division of Archives and History; FHL microfilm 478,485. 1809 Jan 3 – Alsey Going was married January 3, 1809 to William Tulloh, according to “Caswell County, North Carolina Marriage Bonds, 1778-1868.” John Going was the bondsman. “North Carolina, County Marriages, 1762-1979 ,” database with images, FamilySearch(https://familysearch.org/ark:/61903/1:1:XF96-5YM : 10 February 2018), William Toller and Alsey Going, 03 Jan 1809; citing Caswell, North Carolina, United States, p. , North Carolina State Archives Division of Archives and History; FHL microfilm 478,488. Private for col. Dixon in Virginia. …At following battled: Battle of Brandywine wounded in knee and ankle by Grape Shot … Battle of Camden or Pine Town? North Carolina (Battle of Hobkirk’s Hill at Camden SC) when General Nathanael Greene commanded… Battle of the Cowpens … Battle of Guilford … Battle of Eutaw Springs … and at the Battle of York Town when Cornwallis with his army were taken by Genl Geo Washington. …1819 May 26 … Col Eskridge Kinner a magestrate for Hawkins Co, Tn and James Cox a citizen also of said County and State .. acquainted with sd William Going … he has worked for them on their farms and always conducted himself well and behaved like an honest, upright man … believe that what he has stated is true. …1839 June 8 – Elizabeth Goings 70 years old and resident of Hawkins Co, TN … she is the widow of William Goings … she was married to him in the month of October, 1793 in Caswell County, North Carolina … her husband died at his residence in Hawkins County afsd on the 23d day of August 1827 and that since then she has not been married. 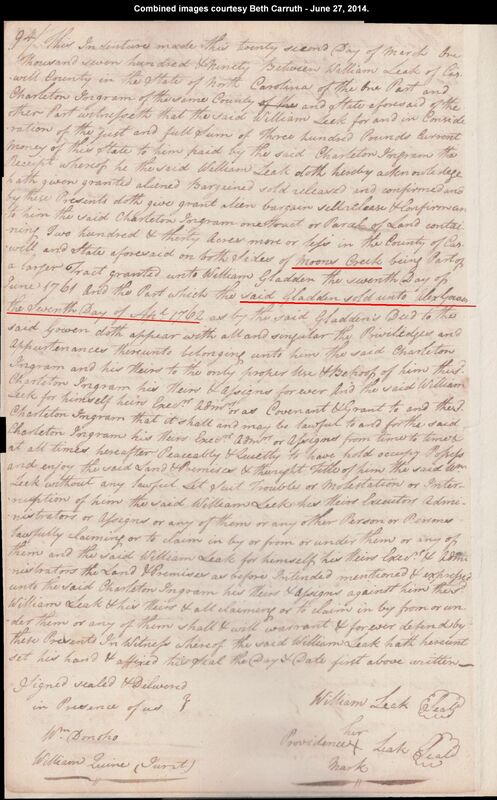 (same affid) Peter Goings says he has been acquainted with the said William and Elizabeth ever since he was a small boy, being a man aged about 30 years (b abt 1809) and he believes said William and Elizabeth were married as she states, in Caswell County, North Carolina and at the time stated … Signed: Agga Goings, Peter Goings. …1839 Sept 25 – Extraction from Nancy Lemmons Testimony on September 25, 1839 On the 25th day of September 1839 testimony was given by Nancy Lemmons stating that she was 69 years old and that she was well acquainted with William and Elizabeth Goings and that she was present when they did get married in Caswell at the house of William Rainey in the month of September or October in the year 1793. She further stated that she lived about twelve miles from the Goings when he died and her husband said that neither one of them could read or write and did not have a family bible and they kept no word of their marriage or births of their children. John Goin was married November 24, 1795 to Betsey Hickman, according to “Caswell County, North Carolina Marriages, 1759-1850.” The marriage is confirmed by “North Carolina Marriage Bonds, 1741-1868,” record 1108, bondsman Burbage Going, witness William Rainey, Bond No. 15498. Children born to John Goin and Betsey Hickman Goin are unknown. Alsey Going was married to William Tulloh January 3, 1809, according to “Caswell County, North Carolina Marriages, 1759-1850,” record 1312, bondsman John [X] Going, witness Ald Murphey, Bond No. 18687. Nothing more is known of William Tulloh and Alsey Going Tulloh. Goodrich Going was married to Betsey Matthews September 6, 1791, according to “Caswell County, North Carolina Marriages, 1759-1850.” The marriage is confirmed by “North Carolina Marriage Bonds, 1741-1868,” record 01108, bondsman Allen Going, H. Haralson, Deputy Clerk, bond 000015499. Of Goodrich Going and Betsey Matthews Going nothing more is known. Healy (Heaty?) Going was married July 19, 1803 to William Pryor, according to “Caswell County, North Carolina Marriages, 1759-1850.” The marriage is confirmed by “North Carolina Marriage Bonds, 1741-1868,” record 1245, bondsmen Jesse Going and Nathaniel Pass, witness, H. Haralson, Bond No. 7625. Jesse Going was married to Seeley Bairding June 9, 1784, according to “Caswell County, North Carolina Marriages, 1759-1850,” record 1108, bondsman John Going, witness Ald Murphey, Court Clerk, Bond No. 15501. Of Jesse Going and Seeley Bairding Going nothing more is known. Jesse Going was married to Polly Draper November 12, 1807, according to “Caswell County, North Carolina Marriages, 1759-1850.” Vincent Going was bondsman, and Ald Murphy was a witness. Children born to Jesse Going and Polly Draper Going are unknown. John Going was married to Betsey Hickman in 1795, according to the research of G. C. Waldrep III, Ph.D. of Milton, North Carolina. Children born to John Going and Betsey Hickman Going are unknown. Lithe Going was married November 10, 1783 to David Loughlin, according to “Caswell County, North Carolina Marriages, 1759-1850.” They were married November 18, 1783 according to “North Carolina Marriage Bonds, 1741-1868,” record 01179, bondsman Jesse “Made his Mark” Going, witness Ald Murphey, bond 16605. Nothing more is known of David Loughlin and Lithe Going Loughlin. Alexander Gowin was listed in the 1777 tax roll of Caswell County, Richmond District. Richard Gowin was married July 4, 1807 to Polly Bennett, according to “Caswell County, North Carolina Marriages, 1759-1850,” record 01110, bondsman James Rainey, witness Ald Murphey, Court Clerk, bond 000015536. Children born to Richard Gowin and Polly Bennett Gowin are unknown. Vincent Gowing was married to Nancy Reed December 30, 1806, according to “Caswell County, North Carolina Marriages, 1759-1850,” Record No. 1110, bondsman Burch Swan, witness Alex Murphey, Deputy Clerk, Bond No. 15537. Children born to Vincent Gowing, Nancy Reed Gowing and Margaret Stacy Gowing are unknown. Allen Going was the bondsman for the marriage of Ezekiel Mathews to Sarah Cumbo May 7, 1793, according to “Caswell County, North Carolina Marriage Bonds, 1778-1868” by Katherine Kerr Kendall. In December of that year he was a purchaser at the estate sale of Edmund Hendley in Person County. “Allen Gowin” paid tax on one white poll in the 1794 tax list of Person County, St. Lawrence District. “Allen Gowen” was on the 1805 tax list of Person County in Capt. Penicks Company. Alsey Going was married January 3, 1809 to William Tulloh, according to “Caswell County, North Carolina Marriage Bonds, 1778-1868.” John Going was the bondsman. Edward Goins appeared in the 1784 tax of Caswell County, St. Luke’s District as the owner of 100 acres on Hico Creek. In 1791 this district was in Person County when the new county was created. “Edward Goine & wife, “blacks” were enumerated about 1787 in Caswell County. “Ed. Goins” paid tax on “two white polls” and 245 3/4 acres of land according to the 1794 tax list of Person County. “Edward Goins” was a taxpayer in 1795 in Person County. “Gutrich Going” appeared in the 1784 tax list of Caswell County, St. Lawrence District as the owner of 175 acres on Cane Creek. Gutridge Going, free colored, was listed in the 1786 census of Hillsborough District, Caswell County, St. Lawrence District, page 83 as the head of a household . Since the household was free colored, no enumeration was made of the individuals in the family. “Goodrich Going” was married to Betsey Matthews in Caswell County September 6, 1791, according to “Caswell County, North Carolina Marriage Bonds, 1778-1868” by Katherine Kerr Kendall . Allen Going was bondsman for the marriage of Gutridge Going and Betsey Matthews Going, posting Bond No. 1549. H. Harralson was a witness. When Person County was carved from Caswell County in 1791 Gutridge Going found himself in the new county. He was listed in the 1793 tax list, the earliest one, of Pearson County as the owner of 300 acres of land. He paid tax on one poll, according to the St. Lawrence District list, page 93. “Guthridge Gowin” paid tax on 213 acres in St. Luke’s District, according to the 1794 tax list of Person County. “Guttridge Goen” reappeared on the 1795 tax list of the county. “Jesse Gowin” was listed on the 1777 tax roll of Caswell County in Caswell District. Haley Going was married July 28, 1806 to William Pryor, according to “Caswell County, North Carolina Marriage Bonds, 1778-1868.” Jesse Going was bondsman. Jesse Going was married to Seeley Bairding [Bearden?] June 9, 1784, according to “Caswell County, North Carolina Marriage Bonds, 1778-1868.” John Going was bondsman for the marriage of Jesse Going and Seeley Bairding Going, posting Bond No. 15501. Ald Murphy was a witness. Another entry in the volume reverses the positions of the groom and the bondsman. It shows that John Going was the groom and Jesse Going the bondsman. Jesse Going was the bondsman for the marriage of Betsy Gilaspy to Roger Warf January 5, 1802, according to the same volume. Jesse Going was married to Polly Draper November 12, 1807, according to the same volume and “North Carolina Marriage Bonds, 1741-1868,” record 1108, Bond No. 15500. Vincent Going was bondsman for Jesse Going and Polly Draper Going. John Gowin was named executor of the will of John Mann October 30, 1792, according to the will records of Person County. John Goin was married November 24, 1795 to Betsey Hick­man, according to “Caswell County, North Carolina Marriage Bonds, 1778-1868.” Allen Going was bondsman for the marriage of John Goin and Betsey Hickman Goin. Another record shows Burbage Going as bondsman and William Raney as witness. The marriage is confirmed by “North Carolina Marriage Bonds, 1741-1868,” Bond No. 15498. Nothing more is known of John Goin and Betsey Hickman Harris. “John Going” appeared as the head of a household in the 1810 census of Caswell County, page 477. John Goin, “orphan, now age of 11 years,” was bound to Charles Willson in 1827, according to “Caswell County, North Carolina Will Books 1814-1843” by Katherine Kerr Kendall and Mary Frances Kerr Donaldson. On October 14, 1827, John Goin, “child of color, age 15” was bound to Charles Willson. Judrick Going was listed as a taxpayer in Caswell County in 1784, according to “North Carolina Taxpayers” by Clarence E. Ratcliff. Lithe Going was married November 18, 1783 to David Louchlin, according to “Caswell County, North Carolina Marriage Bonds, 1778-1868.” Jesse Going was bondsman. “Michile Gowine & wife & sons, Michele & David; daughter, Elizabeth & William Wilson, blacks” were enumerated about 1787 in Caswell County. Patsey Going was married December 3, 1790 to Patrick Ma­son, according to “Caswell County, North Carolina Marriage Bonds, 1778-1868.” Zachary Hill was the bondsman. The marriage is confirmed by “North Carolina Marriage Bonds, 1741-1868,” record 1194, witness H. Haralson, Bond No. 16836. Richard Gowing was listed as “insolvent” in 1804, according to “Caswell County Will Books 1777-1814” by Katherine Kerr Kendall and Mary Frances Kerr Donaldson. “Richard Gowin” was married July 4, 1807 to Polly Bennett, according to “Caswell County, North Carolina Marriage Bonds, 1778-1868.” James Rainey was bondsman for the marriage of Richard Gowin and Polly Bennett Gowin. Rhoda Going was married July 28, 1806 to George Stephens July 28, 1806, according to “Caswell County, North Carolina Marriage Bonds, 1778-1868.” Joseph Flippa was bondsman. The marriage is confirmed by “North Carolina Marriage Bonds, 1741-1868,” record 1294, Bond No. 18402. Nothing more is known of George Stephens and Rhoda Going Stephens. Sally Going was married June 21, 1806 to Richard Chapman, according to “Caswell County, North Carolina Marriage Bonds, 1778-1868.” James Vaughn was the bondsman. The marriage is confirmed by “North Carolina Marriage Bonds, 1741-1868,” record 1050, bondsman James Vaughan, witness Ald. Murphey, bond 14583. 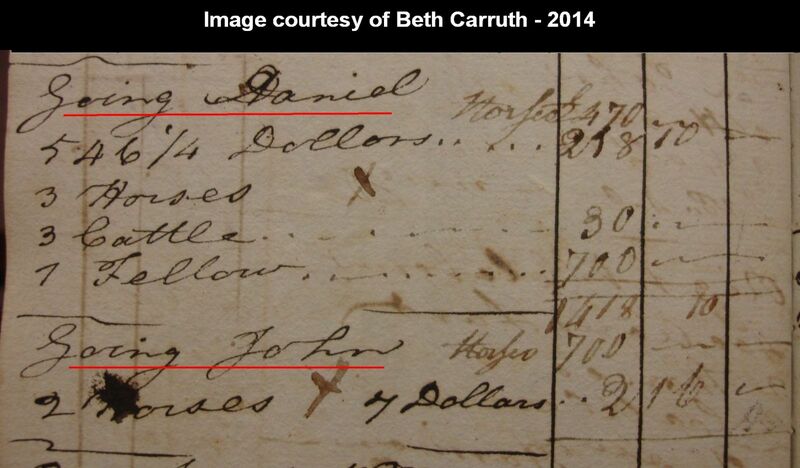 “Sythe Gowin & Daniel Gowin” appeared as taxpayers on the 1777 tax roll of Caswell County, Richmond District. Their assessment of £14, 6 shillings, 8 pence included two tithables. Sythe Going owned 400 acres of land in Pittsylvania County, Virginia in 1782, according to Jack Harold Goins. (Not a good index, need to go page by page). Minutes of County Court 1777-1868, pg. 3. Caswell Co, NC. Joe Going – J N Cook and wife, bk 72, p 81. 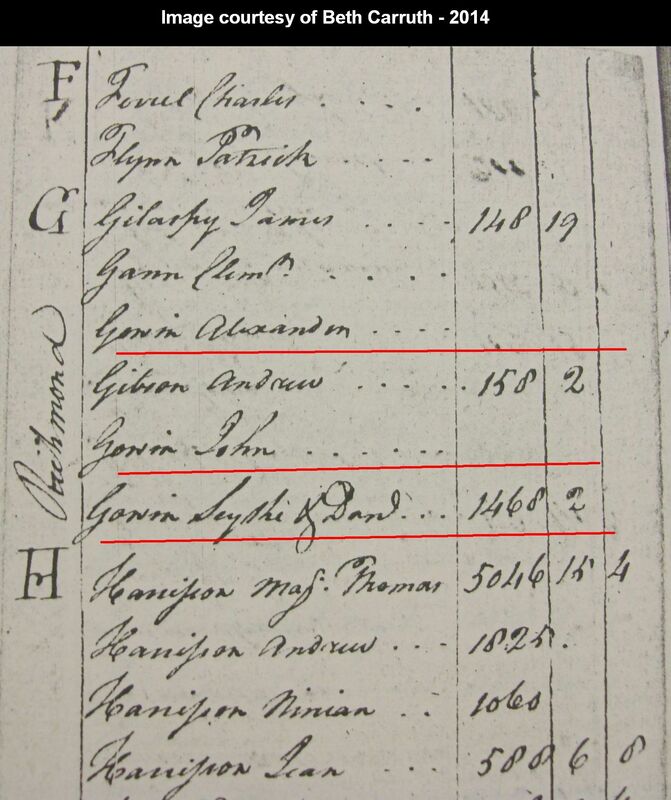 Alexander Gowen Sr – 1762 land transactions with William Going and William Gladden. 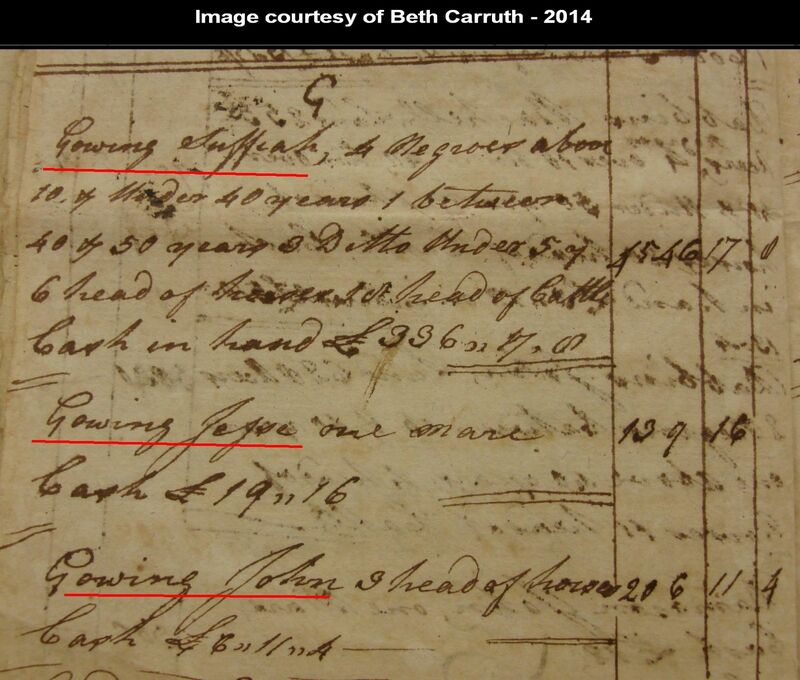 William Gowing – 1762 land transactions with Alexander Gowen Sr and William Gladden. Edward Going – 1784 pd tax in Caswell co, 1787 Edward Goine and wife black pd tax in Caswell Co, 1791 pd tax in Person Co area that had changed from Caswell Co, 1792 actually in Person Co, but very near border with Caswell Co., 1794, Ed Goins pd two “white” polls in Person Co, 1795 Edward Goins pd tax in Person Co, NC. Patsy Going – 1790 married Patrick Mason, Caswell Co, NC. Allen Going – 1793 bondsman marriage of Ezekiel Mathews to Sarah Cumbo, in Caswell Co, NC, 1794 tax in Person Co, 1805 tax in Person Co, NC.